Spray painting has become the most common type of painting used these days. The spray makes it immensely easier and fast to paint. But spray painting effects on the weather too. When we talk about spray painting in cold weather we must know that it is tough to be done moreover comes with various problems along. Spray painting in metal and the wooden material seems very hard in cold weather. The moisture and temperature hold an essential role in spray painting and is if the temperature is low and humidity is high it becomes challenging to spray paint. But don’t worry what are we here for, we are going to mention a list of problems faced by a painter while applying paint on a cold weather day. But first of all what needs to be cleared is that why is it difficult to spray paint during cold seasons? Ice and snow cover up the land due to which it takes a lot more time to dry the paint and also in many cases the chemical paints don’t work on surfaces with cold temperature due to which the paint application becomes thick at some places and How does a Can of Spray Paintwork? Now let’s talk about the problems faced during spray painting at the time of cold weather. The layer or film of paint becomes thick which causes lumps in the painted surface. Sometimes the thickness of coating becomes so thin that the durability of the product decreases. Orange peeling is a result of colds weather. There can be times when the spray gun gets stuck and does not work correctly and clogs sometime. More time is required to dry the paint. Runs and drips can occur due to the cold temperature. We have discussed the problems related to the cold weather and spray painting. Now let’s put light on the tips and tricks for spray painting in the cold weather. Before applying the color with the spray gun, one should clean the spray gun correctly. There can be a chance of ice in the gun at such low temperatures. It also helps in avoiding the circumstances like clogging, jamming, etc. At minus degree temperature there is a possibility that you might find frost on the surface so make sure you clean and wipe the surface and scrape off if any ice on the cold too. While considering painting the painter should always refer the manual for painting at rough weathers making it easy for him to understand the problems while painting. The exact temperature range for coating should be found out. It can vary from colors to colors and in some cases spray paints might have differed by curing agents for every paint and at low temperature. It should be ensured that the cover that is painted is secured during the drying process of coating. There are always chances to get the surface mishandled like getting marks and tore because the paint is still soft. Induction time is significant while spray painting in the cold weather. There should be proper maintenance of the break time for getting the cold cure systems while spray painting. There is a cold treatment time which actually means the exact time required for mixing of the components and to paint evenly in the icy weather. To ensure that there are no pitfalls a person should try to heat the material and a tent would work amazingly with a shelter. While starting to paint you might find frost on the surface. We would suggest that in this kind of situations wipe off the surface, scrape the frost and carefully wipe the whole surface. 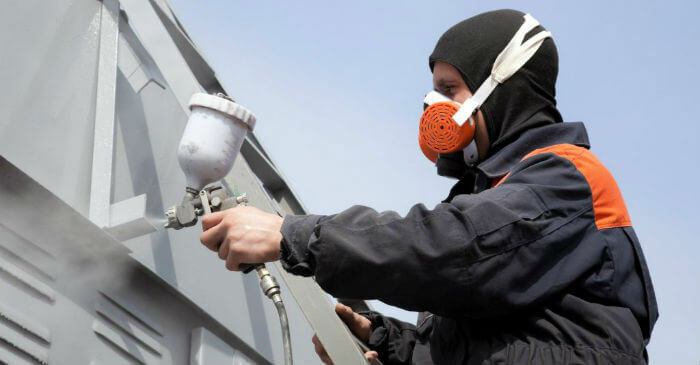 During spray painting always check the temperature of the surface as there is still a difference of temperature in the temperature of the cover and temperature of the air. During cold weather, the most robust tea painting is of the exterior parts like car painting or painting interiors of a house. There is a drastic change in the temperature at someday it is a bad weather at some days a cold weather. We hope you liked the article for any query or comment please write in the comment section below.